We use a quick, nonpainful laser- a highly focused beam of light t- whose wavelength is attracted to the colored pigment in the vein . This selectively treats only the ugly broken vessels that are creating a map on your legs. Our doctors can also use a laser to treat varicose veins. EVLT, or endovenous vein ablation isone such example of a treatment for the larger varicose veins that are creating the spider veins to begin with. Depending on the number and size of your reticular veins, simple laser vein treatment can be done with out any needles or incisions-on the outside of your skin. We can treat spider veins and small varicose veins just under the surface of the skin. At times, more than a single laser session is necessary, 6 to 12 weeks apart, as prescribed by your doctor. 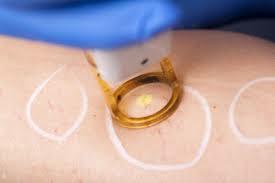 A good vein center will do a doppler ultrasound to map and measure the veins you can’t see under the skin first. This will tell you the appropriate treatment to start with, as often “feeder” veins-larger veins that have stopped working- will continue to create more spider veins as fast as you can treat them, if these are not addressed. After laser treatment of broken capillaries and small vessels, you can walk out immediately and resume normal daily activities. After endovenous laser treatments of larger varicose veins, stockings should be worn for a short time. Laser vein treatment has been safely and effectively used for over 20 years. The more experience your doctor has had with laser, the less risk you are likely to have. Talk to your doctor about how often any side effects happen in his or her practice. Transient itching or burning, mild in nature are common. this usually doesn’t last long.